Recently my wife and I made another trip to Las Vegas…part business and part pleasure. Whenever we are on one of these trips, we always seek a good dinner or two, and occasionally experience something special. 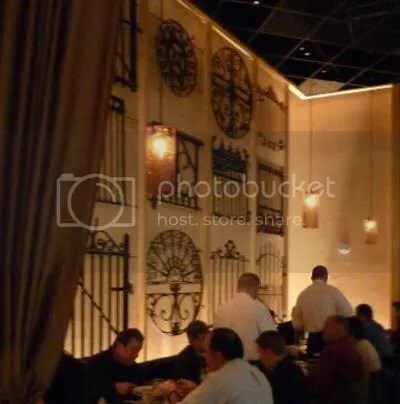 That’s just what happened when we sought out Emeril Lagasse’s Table Ten Restaurant. Most people would not realize that there are four Emeril’s restaurants in Las Vegas: New Orlean’s Fish House, Delmonico Steak House, Lagasse’s Stadium, and Table 10. The name Table Ten refers back to the beginning of Lagasse’s burgeoning restaurant empire 20 years ago when Emeril and his staff would regularly meet in a building in the Warehouse District of New Orleans, always at the same table, labeled number 10 on the blueprint. Though not the original table 10, there is a table 10 inside a smoked glass room you can reserve for dinner. The restaurant is located with the Palazzo Casino Hotel. The restaurant has a pleasing rustic look to it. We were immediately seated and immediately attended to by a very friendly, interesting waiter by the name Cregan, who is a former Chef himself with a wealth of insights about Emeril’s culinary creations and food in general. For starters, Cregan quickly treated us an anti-pasto Amuse Bouché; it was a small bite of heaven, which set the tone for the rest of the meal. Next came the appetizers–right on time. We chose a tried-and-true standard with calamari accompanied by two sauces that were anything but standard: one was a picante sauce and the other was an exquisite lemon parseola with a citrus glaze that was the best sauce I have ever tasted. 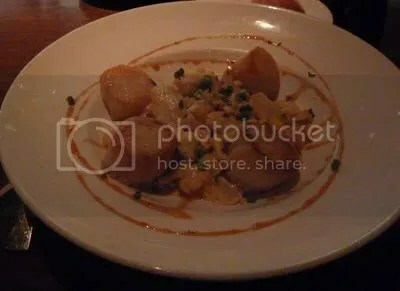 From Diana Davey’s (Table 10’s Head Chef) kitchen, Cregan delivered Pan-Seared Maine Scallops that were basically life-changing! The scallops were mingled with jumbo crab lumps, tomato succotash, and finished with a Creole tomato glaze. It was the sort of dinner that transcends mere sustenance to become life experience. At this point, my wife and I did the only left to do: order dessert. After much deliberation I chose the White Chocolate Malassadas rolled in Cinnamon sugar. This is a signature dessert for Emeril’s and there is a reason for that: it is beyond-belief good! Don’t take my word for it…go taste for yourself. The food is stellar but the restaurant itself captures your interest. Just to the right of our table was a wall with what appeared to be artistic wall plaques. They were actually remnants of New Orleans salvaged from the destruction of Katrina. There is another room called the Gate Room that has wrought iron gates hanging on the wall, very appropriate for New Orleans. The kitchen was spacious and spotless and had a large window overlooking the boulevard which gave it an open feeling which I am sure was appreciated by the chefs working there. It would be amiss for me not to mention the excellent General Manager behind the success of Table 10, Ki Song An. He went from bussing tables at Delmonico, another restaurant owned by Emeril Lagasse, to Front Server to Captain to Manager of New Orleans Fish House in Las Vegas and finally asked by Emeril Lagasse to be the GM for Table 10. Ki Song An has brought harmony and first-rate friendly service to a unique restaurant that should be in your dinner plans if you visit Las Vegas.